This is the third and final part in a training series on rip currents. The topic of forecasting daily rip current risk can be explored by operational forecasters, many of whom do not have a physical oceanography background. The hazards of rip currents and a review of the factors that contribute to rip current development are discussed. To demonstrate the process of a rip current forecast and as an example of what can locally be developed at the user’s station, the module presents a rip current worksheet that is used operationally at some forecast offices. Various parts of this worksheet require the use of observed data and model output. These resources range from NOS Detailed Wave Summary reports to NOAA WAVEWATCH III model polar plots of wave spectral energy. The usage of these products in terms of rip current forecasting using the worksheet is explained in detail. In particular, the issue of “wave masking” in the 2-D model plots is illustrated. In order to practice with the products presented, the user is provided two cases (East and West Coasts). Other factors discussed include tide and lake levels as well as situational awareness. Lastly, a summary of important points from the module and experienced forecast offices is provided. Users are encouraged to examine the state of their office’s rip current program and develop a plan for improvement based on concepts and ideas presented in this module. This is a good hands-on lesson for the practicing forecaster, but it is also informative for the weatherwise beach visitor to understand the risks and factors for rip currents and provide enhanced personal safety. Very good course. Principles of this course are used this summer (2015) in the rip current forecasting model of www.muien.nl. Results look good. Another step ahead to a Dutch RIPCURRENT warning system. very good course! We should apply this to the Netherlands coast but we do not have the same tradition in putting all possibly data including model results on internet! Describe the important elements that determine rip current risk. 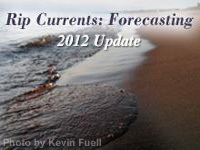 Describe a process and resources that can be used to develop a local rip current forecast scheme. Given wave data, determine whether wave masking is occurring and what the appropriate swell or wave components are to assess rip current risk. Describe factors, other than swell and wind waves, that can alter rip current risk. March, 2012: This module has been updated to provide greater flexibility in navigation and linking to specific content. In addition, minor changes have been made to improve the clarity of the content and correct inconsistencies. However, these changes do not affect the overall substance of the material taught.